Start: SD823403 Barley village car park (£1 honesty box). 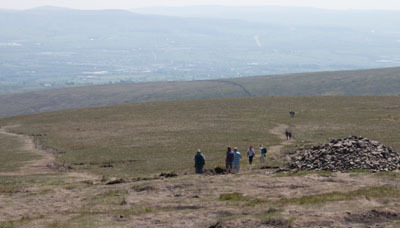 This involves a fairly steep ascent and stretches of unclear paths on the top of Pendle - it is not a route to be undertaken in low cloud, unless competent with map and compass. 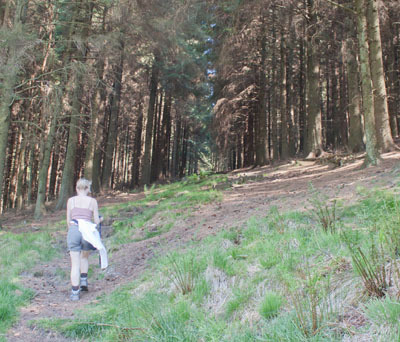 From the summit of Pendle's Big End the path leads down cloughs to pass a reservoir, before climbing through a pine plantation and emerging at Newchurch in Pendle, from where it is a short stroll back to Barley. 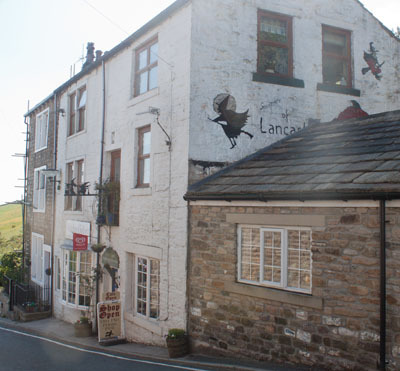 Refreshments: The Cabin (which is adjacent to the car park); Barley Village Tearoom; The Pendle Inn, Barley; Witches Galore, Newchurch in Pendle. 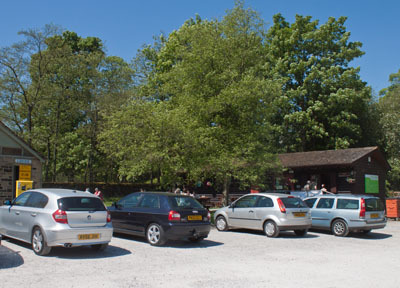 From the car park, follow the path behind the toilet block, which leads to the village. 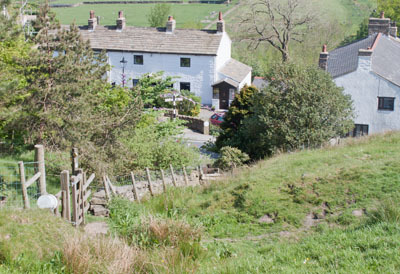 Cross the footbridge opposite the Pendle Inn and continue in the same direction where the footpath joins the road. 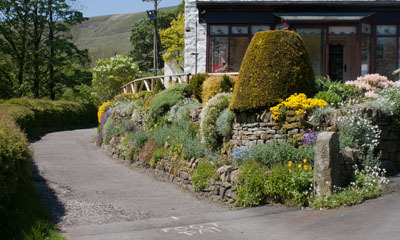 Just before the road crosses a small stream, cross the road and take the waymarked footpath on the left. Go through a kissing gate and cross a footbridge. The path leads over a stile onto another footbridge. Once you have crossed this, turn left to follow a farm track. Where the track divides, follow the better surfaced right hand fork (it's very well signposted, both on the gatepost and the surface of the track). At the next fork, take the left hand track (again, directions are painted on the track surface). 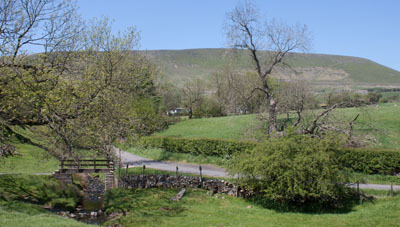 Just behind the cottage pictured there is a metal kissing gate. Go through this to follow a path which starts off narrow and cobbled. The path leads over a footbridge and through a number of kissing gates. 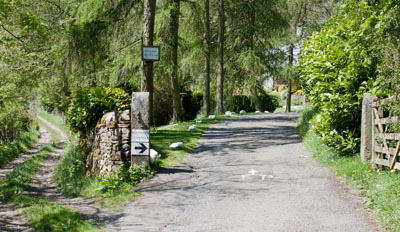 The clear path leads through more kissing gates to the farm building pictured. It passes to the left and then behind the buildings. Turn left when you meet another path, then proceed through one final kissing gate before ascending the stepped path leading diagonally up the hill. 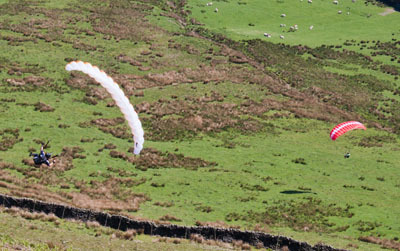 … a ringside seat viewing these two paragliders. Click here to see the view from the helmet of one of the guys. 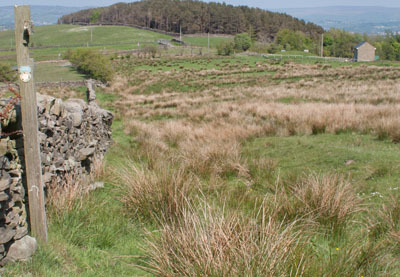 Continue up the path until you can see a stone wall with a stile in front of you. Don't cross the stile. Turn left and follow the wall to the next stile. Again, don't cross the stile. 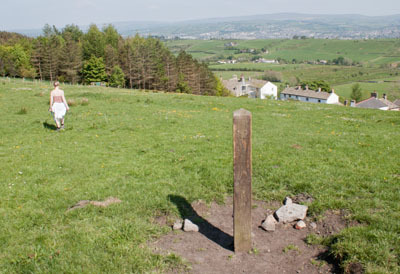 Turn left to follow the clear path to the trig point at the summit. 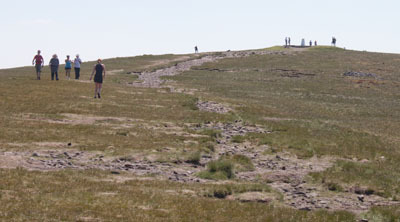 The Big End of Pendle is a plateau, with many paths and tracks, some of which don't lead anywhere. In low cloud it is very easy to become disoriented if you don't have a compass or GPS unit. 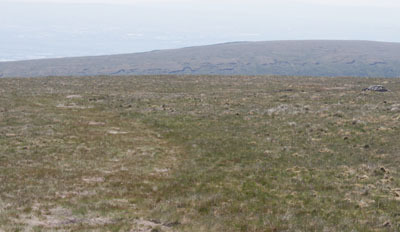 From the trig point follow the track and line of cairns leading south. … but other parts are not. The route is marked by cairns, but they are quite well-spaced. 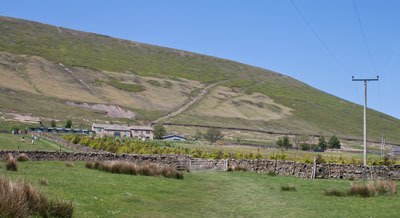 You begin to descend to Boar Clough. 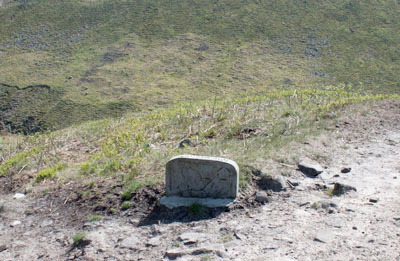 The path divides when you come to the route marker shown. 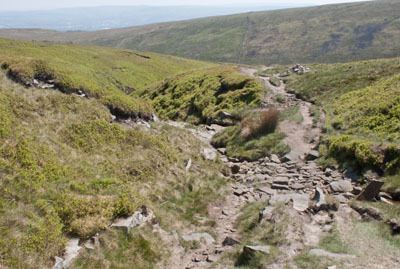 Both paths lead to the foot of Boar Clough, where it joins Ogden Clough, but the path on the left is probably the intended route. ... which takes you above Upper Ogden reservoir. At the end of the reservoir the path winds down the side of the dam where there are further kissing gates. 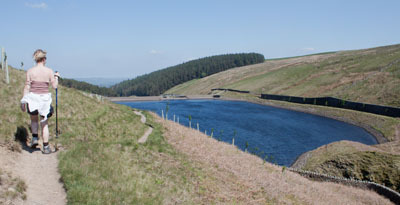 … just before you reach the lower reservoir. 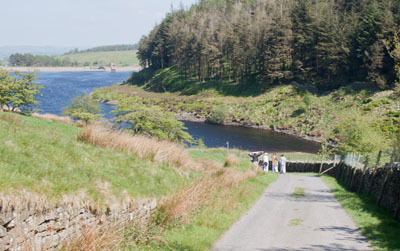 Just beyond the point where the figures can be seen in the photograph go through a gate on right, cross a stream and descend steps. Cross the footbridge shown above and climb steps. … a gate at the top of the hill. 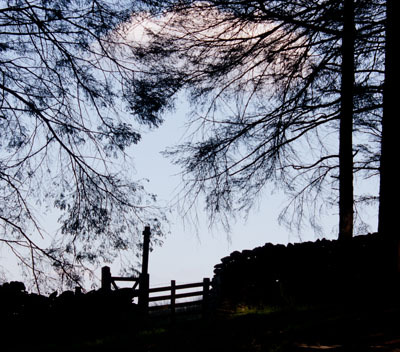 Leave the woods and turn right, following the path by the stone wall. 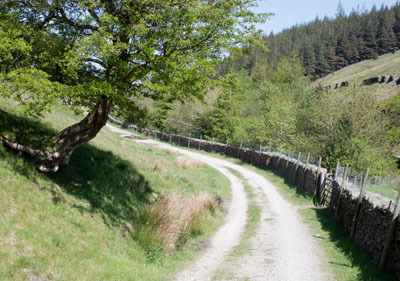 When you reach the edge of the woods, cross a stile and turn left. 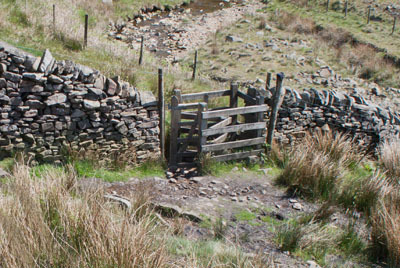 The path crosses a partly ruined stone wall then a gated stile in the next wall. 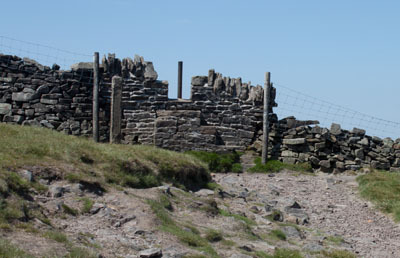 Continue to keep the stone wall on your left until you come to a metal gate with a wooden post and waymarker close by. Walk diagonally right away from the wall (there is no clear path on the ground). … the famous Witches Galore shop and tearoom (this photograph is taken looking back after we'd had a pot of tea in the tearoom). Walk up the road. Where the road bends to the left, take the track on the right and then take the left hand fork in the track. This leads down to renovated farm buildings. Walk past the first building and go through a wooden gate. Before passing the next building turn left to go through another wooden gate and walk down a narrow footpath. The path leads between post and wire fences. At the end of the path cross a stile and turn left onto a lane. Where the lane emerges onto the road turn right, then right again to return to the car park.